R-Studio for Linux extends the family of powerful and cost-effective data recovery software from R-TT to the Linux operating system. 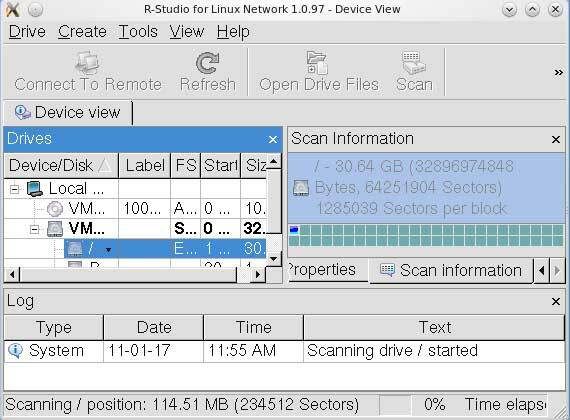 Thanks to R-Studio for Linux\'s flexible parameters and customizable settings, users get absolute control over their data recovery tasks. R-Studio for Linux recovers data from logical disks and partitions as well as disks and partitions that have been re-formatted, damaged or deleted. In addition to disks with common Linux file systems, R-Studio for Linux recovers files from Windows, FreeBSD/OpenBSD/NetBSD/Solaris, and Macintosh formatted disks. Recovered files can be saved to disks with any file system supported by the Linux kernel (i.e. ext2, ext3, FAT, NTFS). Supports hardware RAIDs, volume sets and stripe sets; software RAID 4, RAID 5, RAID 6, volume sets, stripe sets and custom RAID layouts (user can specify and save presets for block size, order, offsets, stripe blocks, etc.). Bootable R-Studio Emergency Disk. R-Studio Emergency version can boot directly from an external USB drive, optical disc or several floppy disks. Useful for recovering data from internal hard drives on computers that cannot startup due to damaged or corrupted file systems. In-place saving of recovered files on a remote computer allows to serve computers over the Internet connection. Extended Viewer Plugin allows viewing a content of the found files to estimate recovery chances prior to purchasing. Flexible parameter settings give you absolute control over data recovery.